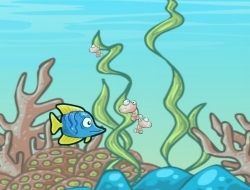 In order to become the ultimate fish in the sea you will need to train your fish in this cool swimming game and you will definitely grow bigger, stronger and faster. Before you enter a race you should feed the fish so it has some energy to do the training you would like. You will always need to complete challenges as well as you can in order to grow his stats. He will soon get tired and time will come as you need to feed him some worms again by swimming for them. All the things you do will add up to the point that you will be the fastest fish around. Fish Race Champions 0.00 between 0 and 10 based on 0 votes.